Capterra helps organizations choose the best software for their business by offering a comprehensive list of business software solutions. Part of their service includes regularly publishing reports ranking business software solutions under certain criteria. ServiceDesk Plus emerged as the clear leader in the number of active users category, with more than 750,000 IT technicians using ServiceDesk Plus to streamline their IT operations. Our large, worldwide customer base accounting for more than 100,000 organizations also helped ServiceDesk Plus get ahead. This recognition from Capterra means that when you use ServiceDesk Plus to manage your IT operations, you can rest assured that you’re getting a best-in-class IT help desk offering vouched for by thousands of IT service management professionals worldwide. With a wide breadth of fine-grained, ITIL-ready modules covering important aspects of IT service management, as well as customizable processes and automated workflows, ServiceDesk Plus gives you a 360 degree ITSM experience by seamlessly integrating with other IT management software from ManageEngine. 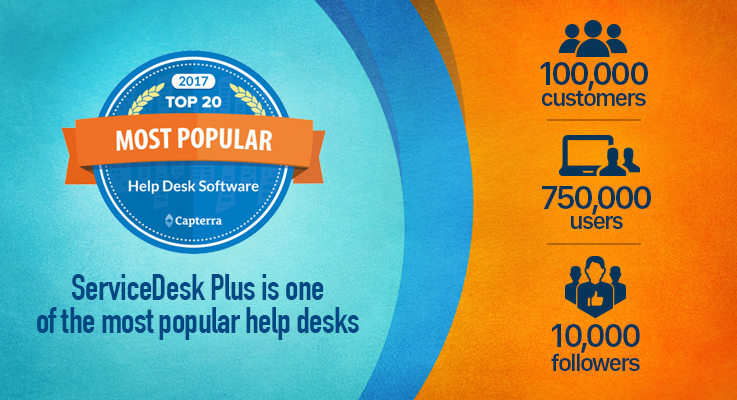 To read the Capterra report on The Top 20 Most Popular Help Desk Software, please follow this link. To learn more about ServiceDesk Plus, schedule a demo, or start your free trial, please visit our website here.